Earn 10 loyalty points, worth £0.10, with this purchase. 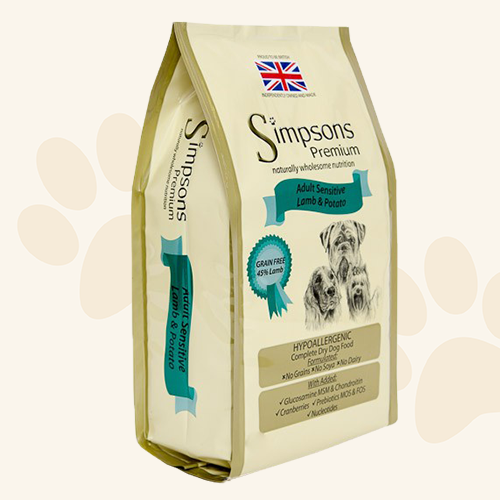 Simpsons Premium Adult Sensitive Lamb & Potato Dry Dog Food is a nutritionally balanced grain free diet ideal for adult dogs with sensitive skin and/or delicate digestions. It is also suitable for Juniors that cannot tolerate grain diets. Made with a total of *45% Lamb it is very digestible and highly palatable making it ideal for fussy eaters, it is also an excellent food for dogs who struggle to gain weight. Lamb (min 45% - Dried Lamb, Deboned Lamb, Lamb Fat) Potato (min 26%) Beet Pulp, Brewers Yeast, Lamb Gravy, Dried Egg, Salmon Oil, Minerals, Linseeds, Vitamins, Yucca Extract, Cranberries, Nucleotides, Mannanoligosaccharides (MOS), Fructooligosaccharides (FOS), Glucosamine, MSM, Chondroitin.